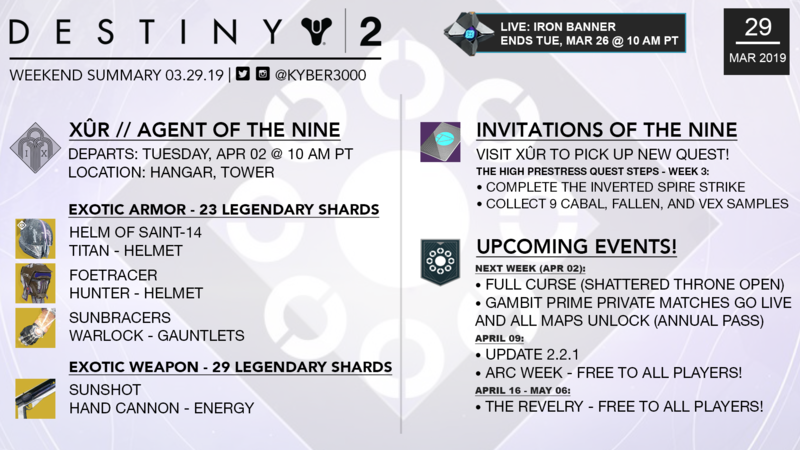 This weekend you can find Xûr hanging out at the Hangar in the Tower and has a new Invitations of the Nine Quest. View Xûr’s inventory, news, and more below. Destiny 2. XUR FORSAKEN EXOTICS & BOUNTY! Xur Location/Loot March 29, 2019. Where is Xur 3-29-2019? by Mesa Sean on YouTube << Click link for more Destiny 2 videos! Full Curse – Shattered Throne Opens! All Gambit Prime maps will be unlocked in Gambit Prime playlist. Gambit Prime Private Matches go live for Annual Pass players. Breakthrough returns as the featured Crucible playlist. Earn extra Valor in the Crucible this week!! View the Reddit thread for more details and to view bounties. This season, Lord Saladin has a few new tricks up his ironclad sleeve. Bungis is introducing two new consumable items that will change the flow of combat through temporary Power level adjustments. Iron Burden: The Iron Burden consumable is for the best of the best to challenge themselves by lowering their Power by 100, putting more focus on skill, strategy, and gunplay. With greater risk comes greater reward. For the brave, Saladin will be offering the Iron Burden consumable for purchase with 5 Iron Banner Tokens. There will be a new Triumph you can complete this Season by defeating 500 opponents while the Iron Burden debuff is active. Completing it will reward you with an updated version of Wizened Rebuke that is fully Masterworked and has a curated roll. You don’t have to complete this during the first event. Your progress will carry over to the next Iron Banner. Bounties have been updated to provide more choice and address feedback from previous Seasons over how long it took to earn progress toward various objectives. Each bounty will grant a powerful reward upon completion. Additionally, completion of a bounty will unlock the ability to direct purchase specific rewards from Lord Saladin. Saladin will also offer a new emblem you can pick up after completing all the weekly bounties called the Weight of Guilt. It will track higher-Power opponents defeated while under the effects of The Iron Burden. Bungie has also added an updated version of Orewing’s Maul with random rolls that will drop from match completion and from token packages. So far the Drifter has received a lot of support. The question still remains: Should he be trusted? To begin, you’ll need to track down Xûr (Fri – Tues). In addition to his Exotic inventory, he’ll also offer a quest item for you to complete each week, for up to nine weeks. Each week you engage, you’ll be invited to learn more about the Nine and unlock lore pages to dive deeper into their story. For Weekly Reset info click here. Thanks for stopping by and supporting this blog. I hope you all have a great weekend!